CivilizationRoman Period, time of King Herrod, 100 C.E. This ossuary dates from the time of the Second Temple when Jewish burial customs dictated the placement of ossuaries in small niches of the burial caves. 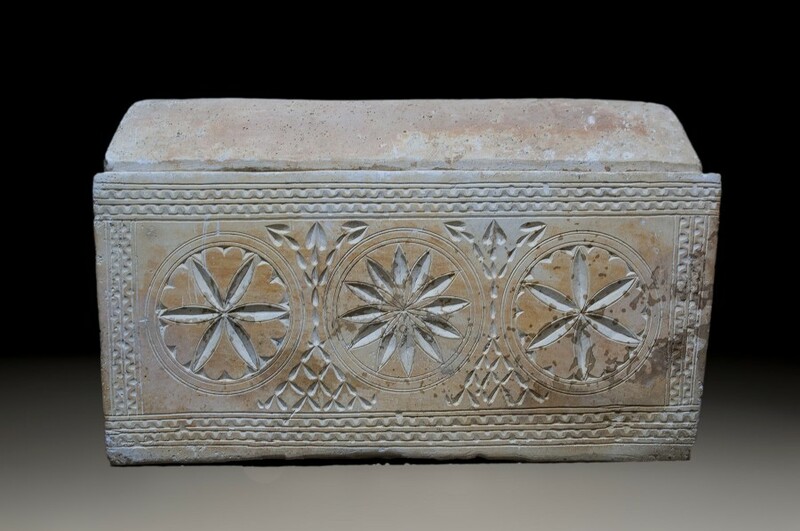 The intricate geometrical shapes and inscriptions carved into the side of the limestone vessel suggest this piece is from the Jerusalem area. The gorgeous masonry along the face of this container shows three stars circumscribed by a large patterned rectangle, while the stars themselves are interrupted by additional lines that cross and rise to a series of skyward arrows. The heavy lid and large base of this ossuary are in excellent condition, dating from approximately 100 C.E. The finely etched patterns on this piece’s face show the natural dry color of the region’s limestone, while the untouched sections have weathered to a soft ochre from the surrounding elements.